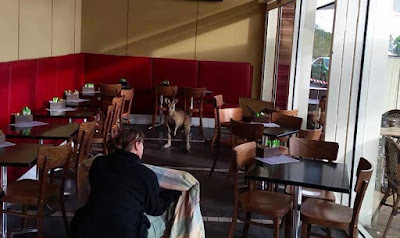 Staff and patrons at a café in Melbourne, Australia, had an unusual guest join them for breakfast on Tuesday morning. A kangaroo hopped though the Epping Plaza shopping centre and into Goldies Coffee House. A Helping Hands Animal Rescue volunteer soon arrived. She slowly approached the small male kangaroo before catching him in a blanket. The kangaroo and volunteer were both shaking their heads throughout the rescue, which Helping Hands say is a form of communication for kangaroos. 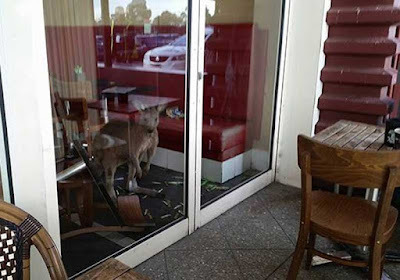 The kangaroo suffered a few minor injuries, including a split lip and toenail wear, from when he first entered the cafe and crashed into windows. He was later released "back to his family" in a safe area away from Epping town centre.